Submitted photo In recognition of National Child Abuse Prevention Month, Family Violence Prevention Center and Michael’s House host the Superhero Child Abuse Prevention and Elimination (C.A.P.E.) 5K Run/Walk every year. Community members are encouraged to register and dress up. BEAVERCREEK — The Family Violence Prevention Center (FVPC) and Michael’s House, Greene County’s Child Advocacy Center will host the Superhero Child Abuse Prevention and Elimination (C.A.P.E.) 5K Run/Walk 9 a.m. April 28 at Beavercreek High School, 2660 Dayton-Xenia Road in recognition of National Child Abuse Prevention Month. Preregistration is strongly encouraged. Participants can register online at www.cantstoprunningco.com or download a registration form on FVPC’s website at www.violencefreefutures.org. Participants can also register at the event location beginning at 8 a.m. for $30. Teams of five or more can register together and participate for a discounted rate of $15 per runner. 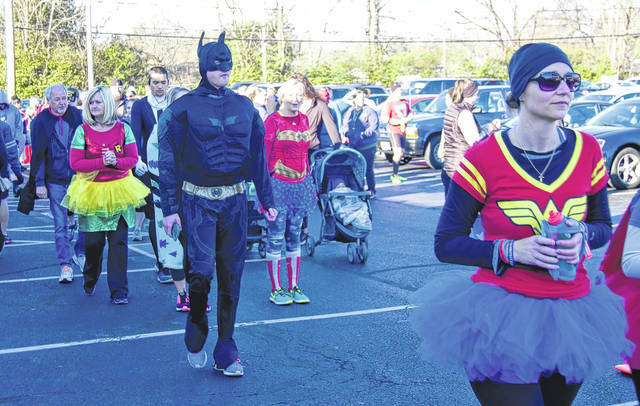 Runners and walkers are encouraged to embrace the Superhero theme again this year by wearing a full superhero costume or cape to demonstrate their superpowers in eliminating child abuse in the community. Prizes will be given to the most “super” running costumes. The annual event provides an opportunity for individuals and families to direct their supportive energies toward an important cause: to stand up for the protection of victims of child abuse and family violence and to help our children feel safe and protected. All proceeds will go toward funding programs at both Family Violence Prevention Center that provide services and safe housing to families and children who have been treated in abusive ways as well as Michael’s House, a nationally accredited child advocacy center. Greene County Children Services, Greene County Board of Developmental Disabilities, TCN/Family Solutions Center, VFW Post # 8312, Enterprise, JB Mechanical, Fairborn Medical Center and the Jacob Barker Foundation are sponsoring the event. Medals will be awarded at the finish of the race and results will be posted on the Can’t Stop Running website. Children in a stroller or wagon will be permitted to participate in the race free of charge, and pets on a leash are welcome as well. Donations will be accepted for those who are not able to participate but wish to support child abuse prevention and intervention services at Family Violence Prevention Center and Michael’s House. Participants are also encouraged to ask their company to provide a matching gift to double their support and efforts. For more information or to register by phone, call 937-376-8526 ext. 112.
https://www.fairborndailyherald.com/wp-content/uploads/sites/50/2018/04/web1_Cape.jpgSubmitted photo In recognition of National Child Abuse Prevention Month, Family Violence Prevention Center and Michael’s House host the Superhero Child Abuse Prevention and Elimination (C.A.P.E.) 5K Run/Walk every year. Community members are encouraged to register and dress up.